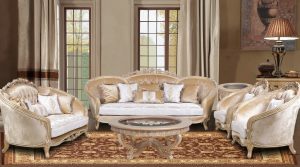 The Hollywood Swank Starry Night Vanity glitz and glamour of old Hollywood and the Sunset Strip take center stage in the Hollywood Swank Collection. Unique finishes combine with stunning details such as decorative metal trim, and butterfly door closeures on select pieces, bringing flair to the room.The quality and attention to detail are masterfully blended throughout the entire collection, which features lovely shapes, luxurious fabrics, distinctive details, and faux wraps. Beauty connects form with function, bringing versatility and elegance to any home.